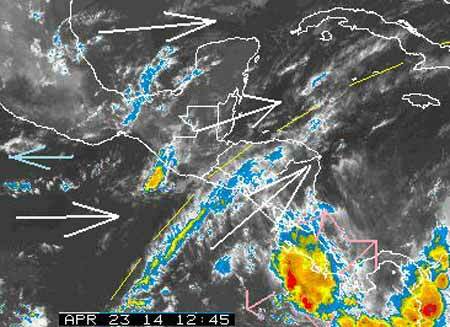 Belize NMS: Mainly fair weather conditions prevail. Light and mostly dry easterly flow supports tranquil seas and good weather conditions. 24-hour forecast: Mostly sunny skies today and partly cloudy skies tonight. Showers, if any, will be isolated. Today: Winds: East 5-15 kts. ; seas: Light chop - choppy. ; waves: 2-4 ft.; only isolated showers, if any. Marine Outlook: Thursday night:- Winds: E-SE 5-15 kts. ; seas: Light chop - choppy. ; waves: 2-4 ft.; mainly fair. General Outlook: For Thursday and Thursday night is for continuing mainly fair, warm and dry weather. We have a very calm and clear morning on Ambergris caye. The wind is from the the East at 3 mph and our expected high is 87. Last night the Radar, on all ranges, was showing light rain over almost all the country and beyond, but I believe it was wrong, I suspect it was being fooled by something in the air, possibly that dust, that I saw yesterday evening as the sun was setting, layers of what looked like cloud, but were very orange in colour. Small patches of light rain being shown on the low land this morning, but I think that may well still be the Radar confused. This morning appears to be almost totally cloud free, just a few high level thin clouds. Probably a hot sunny day, some cloud building up later, but no sign of rain.